If you read last week’s post (or I should say, when you read last week’s post), you learned that simply changing 3 words was enough to motivate an extra 10–15% of people to go out and vote. I know; so awesome, right? This is why you should tell your friends about this blog. In fact, it seems that one of you did. And that friend was Mark Zuckerberg. Pretty cool, right? But as the media has recently been clamoring about, facebook doesn’t just incorporate research into their site, they actually conduct it on people themselves. Maybe not as cool now…? For example, facebook researchers recently manipulated whether your “newsfeed” (the consolidated stream of posts, shared articles, links, etc. from all of your friends) was filled with others’ statuses that expressed either happiness or sadness in order to learn how this affected your own posts. And as one might expect,people were more likely to express happy vs. sad posts themselves if their newsfeed displayed happy vs. sad posts respectively. The top picture is the “control” condition, whereas the bottom picture is the “treatment” condition. Notice how the only difference is the presence of those pictures. Now after learning about this, many people were up in arms about being experimented on, but if you condemn facebook for this social manipulation, what do you have to say about them testing how to increase your likelihood to vote? On one hand, you don’t want to be manipulated unwittingly, but on the other hand, you want to promote the public good. Well regardless of what you think, they’ve already experimented on you. 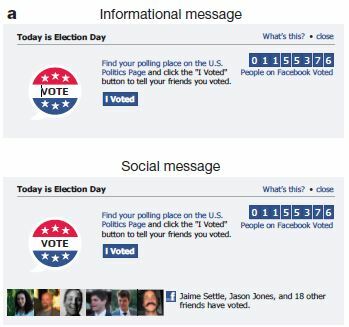 In 2010, facebook once more showed users a message about voting (see the picture on the right) that either did or did not include photos of friends who already posted that they had voted. Then, in a feat of statistical amazingness (there were 61 million people in this study) the researchers matched each of the individuals who saw one of those messages with their public record of whether or not they actually voted. The results showed that merely adding those pictures to the message, those itty-bitty, seemingly inconsequential pictures increased voter turnout by close to 350,000 people. Now, when you consider that those numbers are spread across the entire United States, it may not seem as impressive. However, it nonetheless highlights the effect of subtle social influences on real world outcomes. However, although these influences were positive, they could be more sinister if facebook starts experimenting on how to motivate consumer purchasing…which, let’s be real here, I’m sure they’ve already done. Facebook’s Data Analysis team is really, really legit. I remember looking at job postings for their data analysis team when I was in biz school and they hire PhD’s with work experience, including all the big time computer programs/analytical tools. They recruit internationally and throw $$$$ at the best people. Facebook’s public image is one of a friendly social media site but their corporate culture is a rival to Google or Apple in terms of being driven and competing for the best talent money can buy. Big data is kind of the wave of the future, and while I think it’s useful, most of it is correlational. And as is the case with all correlational data, we have to be careful in interpreting its findings. Nonetheless, I’m glad to hear facebook at least has top notch researchers manipulating us!